When you apply basic operations to matrices, it works a lot like operating on multiple terms within parentheses; you just have more terms in the “parentheses” to work with. Just like with operations on numbers, a certain order is involved with operating on matrices. Multiplication comes before addition and/or subtraction. When multiplying by a scalar, a constant that multiplies a quantity (which changes its size, or scale), each and every element of the matrix gets multiplied. 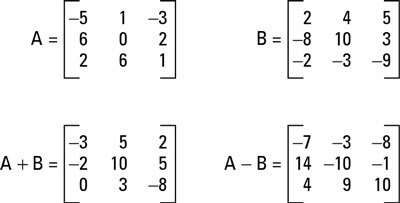 When adding or subtracting matrices, you just add or subtract their corresponding terms. It’s as simple as that. This figure shows how to add and subtract two matrices. Note, however, that you can add or subtract matrices only if their dimensions are exactly the same. To add or subtract matrices, you add or subtract their corresponding terms; if the dimensions aren’t exactly the same, then the terms won’t line up. And obviously, you can’t add or subtract terms that aren’t there! Multiplying matrix A by 3. Insert the matrices into the problem. Multiply the scalars into the matrices. Complete the problem by adding or subtracting the matrices.